The B8 was a smaller-wheeled version of Robinson's B2 Sir Sam Fay class, and were known as the "Glen Almonds" after the prototype locomotive Glenalmond. This first locomotive was built in 1913, one year after the B2 was introduced. A year later, construction of ten further B8s commenced. The failures of the parent B2 class should have been evident by this time, so it is suprising that further locomotives of virtually the same design were ordered. No major rebuilding of the B8s occurred although some of the modifications applied to the B2s were also applied. In 1927, Nos. 5443 and 5004 were fitted with 20in cylinders. No. 5443 was converted back in July 1935, although No. 5004 kept its smaller cylinders until withdrawal. From 1938, No. 5004 was referred to as class B8/2, whilst the other locomotives became B8/1. Boiler changes also followed the same pattern as the B2s, finally settling on a final 28-element superheater design. The B8s were the first locomotive type to be fitted with Robinson's boiler top-feed. The top-feed was fitted to all of the B8s except for No. 4 Glenalmond. Between Grouping in 1923 and the mid-1930s, the top-feeds were gradually removed following LNER policy. The B8s were mainly used on goods trains, as well as some slow passenger and excursion services. Initial allocations were to Gorton, Neasden, and Immingham. By 1923, five were allocated to Annesley. With the LNER's construction of further B7s in 1923, the B8s were displaced from the GC section to March to help with the GE Section's shortage of mixed traffic locomotives. The B8's height restriction posed a major problem, and they were returned to the GC Section by the end of 1926. During the Second World War, the B8s were used on a variety of traffic including heavy goods services and troop trains. They also wandered far and wide, and Glenalmond was sighted in Edinburgh on at least one occasion. As is to be expected from the similarity of designs, the B8s duplicated the faults of the B2 Sir Sam Fay class. However, they survived until 1947 when rapid withdrawals of all of the GCR 4-6-0 types started. The last B8 was withdrawn in 1949. 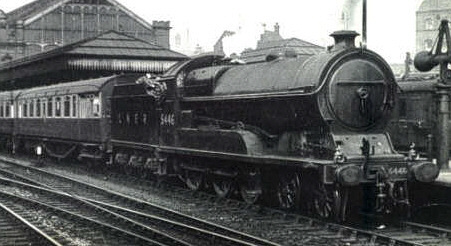 The B8s entered LNER ownership with an intermediate superheater design with 24 elements and 24 flues. The superheater and boiler heating data below, is for the final superheater design fitted to the B8s. Heating Surface: Total: 2387 sq.ft. The last B8 was scrapped in 1949, and none of the B8s survived into preservation. An O gauge (7mm scale) kit of the B8 is available from Gladiator. The five B8s that entered BR ownership were allocated BR numbers, but were withdrawn before receiving them. Glenalmond was named after the Scottish home of the GCR's chairman, Sir Alexander Henderson. Sutton Nelthorpe was named after a GCR director. The other two named B8s were named after World War 1 military leaders. Earl Roberts was famous from the Boer War, but travelled to France to encourage the troops after the Mons retreat. Thank you to the Malcolm Peirson for the above photograph of B8 No. 5446 Earl Roberts of Kandahar.